The Brits in Toronto crew have been looking around for ages for a decent mug that holds a good-sized amount of tea, and we think this is it. 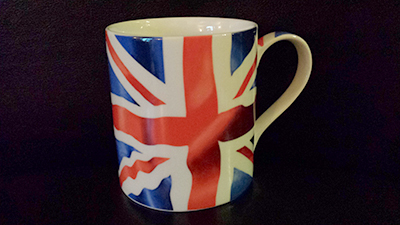 The first plus point in our book is that the Union Jack design covers the whole mug. They certainly didn’t skimp on the red and blue paint (or whatever it is) when they fired this bad boy in the kiln. The flag is extremely well represented across the rotund surface of the mug, and — this really blew us away — also on the top of the handle. Very pleasing indeed. We went to the Brits in Toronto test kitchen, popped the kettle on and waited in anticipation for the brew. That’s always important when buying a tea mug to adequately test it first, but sometimes it’s impossible to do that in the middle of a shop before buying it, but we’re here for you (on a Sunday) taking one for the team. Don’t rush your tea. Take your time. You’ve certainly earned it. All in all, the team are very impressed with this Union Jack mug and give it a solid Brits in Toronto 5/5 stars. This entry was posted in Uncategorized and tagged brits in toronto, tea, union jack mug on October 19, 2014 by britsintoronto.